In this video we will discus, what is a View and it's role in the MVC design pattern. Contains the logic to display the Model data provided to it by the Controller. A view is an HTML template with embedded Razor markup. A view file has .cshtml extension if the programming language is C#. View files that belong to a specific controller are stored in a sub-folder in the Views folder and that sub-folder has the same name as the controller. HomeController has the following 3 action methods. EmployeesController has the following 3 action methods. For each Controller we have a separate folder in the "Views" folder. All the HomeController views are in Home folder in the "Views" folder. 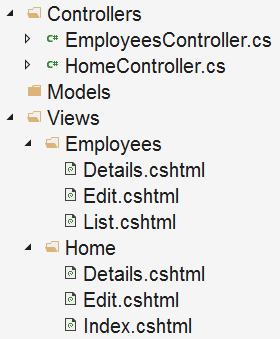 All the EmployeesController views are in Employees folder in the "Views" folder. Each view file has the same name as the controller action method. Consider the following HomeController. We have only one action method - Details(). The Details() action returns a View using the View() method. This View() method is provided by the Controller base class. If a view file is found, the HTML generated by the view is sent back to the client who made the request. If the view file is not found we get the following error.